Today, thousands of dogs woke up in animal shelters across the country with no way of knowing that this day would be their last. And while each has their own story of how they ended up behind a cold kennel door, they're bound together by the same sad fate - having to take their final walk, unwanted and unloved. An estimated 1.2 million dogs are euthanized in U.S. animal shelters every year. But despite being a staggering statistic, it fails to capture the enormity of the tragedy quite like this one haunting image. Pat Gregoire volunteers at the Baldwin Park Animal Shelter, a high-intake facility in Los Angeles, where she photographs adoptable dogs to share on social media. A few years back, she decided to show up before the shelter opened to the public. It was during those early hours when she captured something that happens every day, but which most people will never witness. 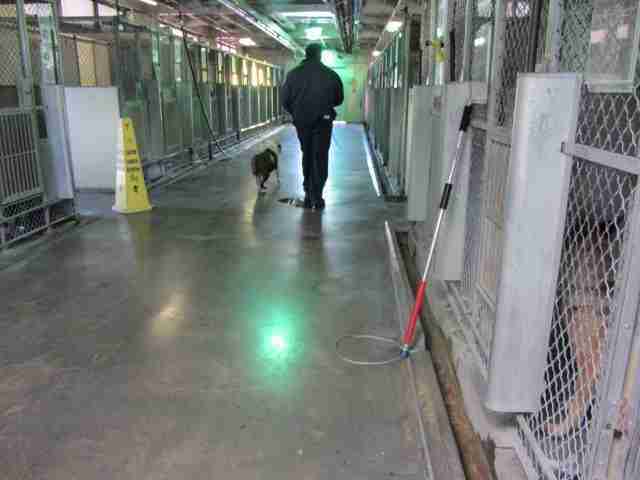 "I had just stopped by the kennel of this dog, who was always very calm, when I saw a worker come to get her. After he took her out, I asked him, 'Where are you going?' He just looked at me and said, 'I'm taking her to the back.' It just hit me, like 'Oh, my God.' I knew what that meant," Gregoire told The Dodo. "This is something the public doesn't get to see." The dog didn't fight as she was led down the hall to be euthanized, but rather walked slowly - almost knowingly - by the worker's side. That's what struck Gregoire most. "I don't know why I snapped the picture. I guess it was because that dog mattered, at least to me," she said. Though that animal's life was taken away, her name and story lost to time, the incident moved Gregoire to try to ensure others' were not so easily forgotten. There was once a time when Gregoire would remove the photographs she shared online if the dogs were adopted or, as in all too many cases, killed because no one wanted them. Nowadays, however, she keeps albums on Facebook as memorials for those pets who had been led on their final walk. "I stopped deleting the pictures, because the dogs that don't make it still matter. They were here," said Gregorie. "I started naming all the dogs, because they at least deserve a name. I have tons of albums, and each album has around two hundred dogs who didn't make it. That's a lot of dogs." "I had no idea, when I started, that these shelters kill so many dogs. When you work there, then you really see. I think that's why so many of us fight so hard, because it just doesn't seem right." To learn about how you can save the life of a dog in need, visit your local animal shelter.